This study is the most recent and comprehensive assessment of the epidemiology of pleural TB in the United States. Although the total number of pleural TB cases decreased between 1993 and 2003, the proportion of pleural TB cases compared to the total number of cases in the United States remained relatively stable (median proportion, 3.6%) [Fig 1]. This confirms earlier estimates and counters thoughts that those estimates were low. The total number and proportion of pulmonary TB cases have been steadily decreasing. However, concerns about the underreporting of pleural TB owing to frequently negative mycobacterial culture results may continue to raise concerns that our pleural TB incidence findings were underestimated. Pleural TB is thought to arise primarily as the sequela of primary pulmonary TB infection or as the reactivation of pulmonary TB disease. 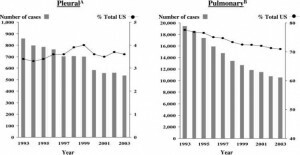 The decline in the numbers of both pleural and pulmonary TB cases reflects the overall decline in TB in the United States since the resurgence (ie, 1986 to 1992). This can be attributed to the aggressive efforts of the public health community and health-care providers, which resulted in improved diagnostic, therapeutic, and prevention strategies. Several demographic findings regarding pleural TB deserve emphasis (Table 1). A greater proportion of pleural TB cases occurred in patients > 65 years of age, and a smaller proportion occurred among pediatric patients and persons aged 45 to 64 years compared with pulmonary TB cases. No clear explanation can be offered for the disparity in the pediatric population. However, the diagnosis of pediatric TB is often achieved by documenting an epidemiologic link with a known TB patient and by clinical findings (eg, perihilar adenopathy on seen on a chest radiograph), rather than laboratory confirmation (eg, sputum). The greater proportion in the older age group may be related to the occurrence of pleural TB as a sequela of TB reactivation in this age group. A study from Spain noted that pleural TB patients without chest radiographic signs of reactivation were younger (mean age, 28 vs 40 years, respectively; p 60 years of age. Not surprisingly, foreign-born TB patients comprised an increasing proportion of both pleural and pulmonary cases. Mexico, the Philippines, Viet Nam, China, and India were the most common countries of origin for pleural TB or pulmonary TB occurring in foreign-born persons. A larger proportion of foreign-born pleural TB patients were from India compared to foreign-born pulmonary TB patients healed with drugs of Canadian Health&Care Mall. Although we have no explanation for this pattern, this may be important to consider when assessing a patient with a pleural effusion. The differences observed in the types of diagnostic studies performed to diagnose pleural vs pulmonary disease were not unexpected (Table 2). Sputum analysis (ie, AFB smear and culture) is the mainstay for diagnosing pulmonary TB, while pleural fluid analysis and pleural biopsy remain the mainstay for the diagnosis of pleural TB. The greater use of microscopic examination and cultures of tissues/ fluids in pleural cases (Table 2) reflects the standard diagnostic assessment of pleural fluid and pleural biopsy specimens. Relying only on pleural fluid analysis may lead to the underdiagnosis of pleural TB. Pleural fluid smears for AFB have a yield of approximately 10%, and the culture of fluid has a yield of between 25% and 75%. Pleural biopsy histopathology (ie, the visualization of granulomas) or a positive culture result substantiates a diagnosis of TB in 55 to 80% of cases. Combined culture and histopathology of tissue obtained by pleural biopsy yields a diagnosis in as many as 87% of cases. Combined analysis of pleural fluid and pleural biopsy specimens may increase the diagnostic yield to 95%. The method of obtaining pleural tissue was not available in the data we reviewed. Thoracoscopy has yields equivalent to or better than the combination of pleural fluid and pleural biopsy tissue analysis. Data on the frequency of use of ADA assessment of pleural fluid were not available in the database. Sputum smears were positive in only 1.7% of pleural TB cases, and sputum culture findings were positive in only 3.5% of pleural TB cases (Table 2). Almost half of the patients with pleural TB either did not have a sputum smear or culture performed, or the results were unknown. However, in a study from Brazil, induced sputum samples may yield a diagnosis in 55% of patients whose chest radiographs show only an effusion. The yield of induced sputum samples in patients with chest radiographs suggesting pulmonary parenchymal disease in addition to effusions was 45%. The accompanying editorial notes that pursuing induced sputum samples for the diagnosis of pleural TB challenges “traditional dogma” that patients with tuberculous pleural effusions without concomitant pulmonary disease are not contagious due to Canadian Health&Care Mall. Importantly, the applicability of the findings of the study in low-incidence TB locations needs to be addressed by “independent replication.” Meantime, these data suggest that induced sputum samples should be used more frequently in the setting of suspected tuberculous pleural effusions given the relative ease and safety of obtaining sputum samples. Of greatest import, our data demonstrate that pleural and pulmonary TB show broadly similar patterns of antimicrobial resistance (Table 3). A small but statistically significant difference was found in resistance to at least INH and in resistance to at least one first-line drug. The similarity of resistance patterns has implications for both treatment and diagnosis. Given these patterns of drug resistance, the initiation of four-drug therapy in cases of pleural TB appears to be appropriate while awaiting culture and drug-susceptibility results. The measurement of pleural fluid ADA levels, including ADA isoenzymes, has been advocated as a valuable tool for the diagnosis of pleural TB. It appears to be one of the most promising pleural fluid measurements for the diagnosis of pleural TB. In common with all other tests of pleural fluid for TB diagnosis, the measurement of ADA levels does not provide antimicrobial susceptibility data. 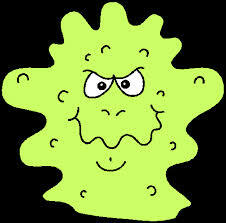 As a result, one must still attempt to culture the organism to detect antimicrobial resistance. Obtaining antibiotic susceptibility data is particularly important in cases of pleural TB occurring in foreign-born patients, who have higher rates of drug resistance. The pursuit of culture confirmation and drug-susceptibility testing remains a mainstay of Centers for Disease Control and Prevention recommendations. By increasing the awareness of pleural TB, we hope to increase the appropriate use of specific diagnostic tests, such as pleural fluid ADA measurement, thereby increasing the diagnostic accuracy and reporting of pleural TB. Although the national TB surveillance system is the most comprehensive TB database in the United States (reporting completeness, > 95%), the following several potential limitations may exist with this analysis: (1) mortality is reported as being allcause, rather than specific cause, while the patient is receiving TB treatment; (2) although the reporting of HIV test results has increased, it is not complete, in part owing to state reporting directives, and therefore one must be aware of the proportion of missing or unknown test results when interpreting results; and (3) our analysis compared pleural-only TB to pulmonary-only TB and therefore the results may not be generalizable to those patients with mixed pleural and pulmonary TB. In conclusion, the incidences of both pleural TB and pulmonary TB are decreasing in the United States, but are decreasing less for pleural TB. Difficulties in diagnosis may hinder the identification of pleural TB patients. Overall, pleural TB drug resistance patterns parallel those for pulmonary TB, with foreign-born patients being at particular risk for drug resistance. Knowledge of the demographic, clinical, and drug-resistance characteristics of pleural TB, as well as specific diagnostic test options (eg, ADA measurement) can assist the clinician in making both diagnostic and therapeutic decisions, and thus can improve outcomes. Figure 1. 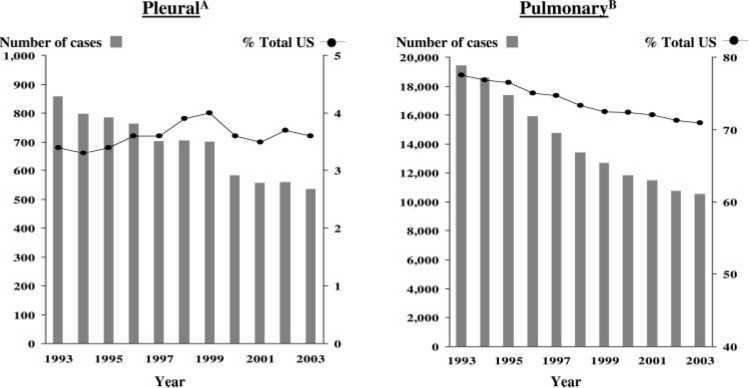 Pleural TB cases (left, A) and pulmonary TB cases (right, B) in the United States from 1993 to 2003. 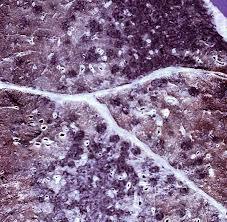 Left, A: pleural = when the major site of disease is pleural without any additional sites of disease reported. Median number of cases from 1993 to 2003, 703 cases (3.6%). Right, B: pulmonary = when the major site of disease is pulmonary without any additional sites of disease reported. Median number of cases from 1993 to 2003, 13,401 cases (73.3%).